A Speed Limit On Germany's Autobahns: 'Like Talking Gun Control In The U.S.' A government committee says capping speeds could reduce carbon emissions and pollution. Opponents say Germans have a visceral need for speed akin to Americans' views on gun rights. Cars drive near Frankfurt Airport on Tuesday in Germany. Much of Germany's autobahn system has no speed limit, and a proposal to cap speeds at about 80 mph has sparked controversy. 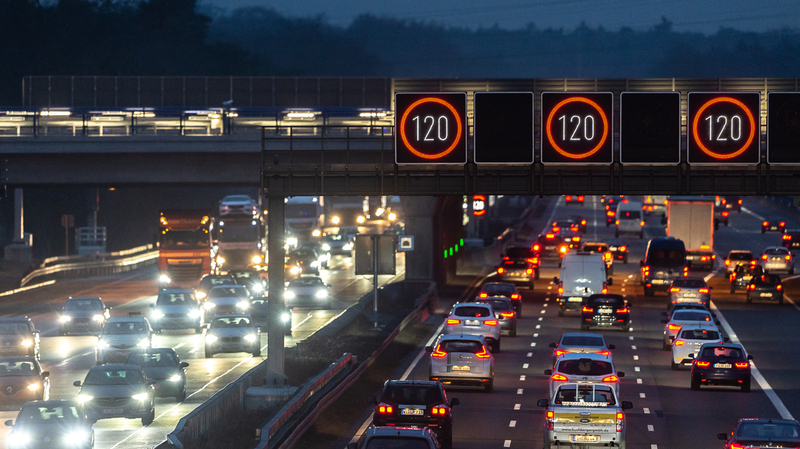 Germany's government has rejected the prospect of imposing a speed limit on the stretches of autobahn that don't have one in an effort to reduce carbon emissions, Deutsche Welle reports. "There are more intelligent control mechanisms than a general speed limit," Seifert said, according to the German broadcaster. "For at least the next year to year and a half there is no chance," Canzler said. "Maybe if the government would change." "No matter how fast you're driving in Germany, someone is driving faster than you," Hanks once said on Late Show with David Letterman. "When another car passes you when you're driving as fast as physics allow ... a blur goes past you. Sometimes it's a red blur, sometimes it's white." Now that may change. The transportation minister convened a panel to find ways to cut carbon emissions from transportation. The panel's working paper leaked to the German press last weekend, and one proposal was to impose a speed limit on the stretches of autobahn that don't have them. Quicker than a passing German car, Transportation Minister Andreas Scheuer changed gears. A speed limit was "against all common sense," the Frankfurter Allgemeine Zeitung reported him saying. Then he canceled the working group's next scheduled meeting. There are more than 8,000 miles of autobahn in Germany, and about 70 percent have no limits on speed, according to the Federal Highway Research Institute, though other roads and freeways do have restrictions. Whether to force drivers to slow down on all sections of autobahn is a perennial debate with entrenched opponents: in one lane, the powerful car industry and its allies in government; in the opposing direction, environmentalists and safety advocates. The Handelsblatt newspaper compared the fever pitch of the public discussion to Americans' polarized views on gun control and abortion. The latest iteration of the speed limit idea emerged out of the National Platform on the Future of Mobility, a government committee tasked with finding ways to reduce carbon emissions from transportation, Reuters reports. The committee's ideas include a 130 kph [81 mph] speed limit on the unrestricted stretches of autobahn and a fuel tax hike, as well as the end of tax breaks for diesel cars, according to Reuters. When asked to provide further details, the panel declined to answer NPR's emailed questions. The Green party supports the proposal. So does the national police union. On Friday, the police union's deputy leader, Michael Mertens, compared his country with neighboring Austria and estimated that Germany could prevent at least 1 in 4 deaths by imposing a limit on all its roads. "In this country, some people legally drive 200 or 250 kilometers per hour [124 to 155 mph]," Mertens told Sueddeutsche Zeitung. "To be clear, that's crazy. At this rate nobody can control their car in stressful situations." By comparison, there is no U.S. road system without speed limits, Joe Young at the Ruckersville, Va.-based Insurance Institute for Highway Safety, told NPR. Young said even Germany's proposed limit of around 80 mph is high, and only a handful of mostly rural American states including Texas, Montana, Idaho, Utah and Wyoming let their drivers go that fast. The German Association of the Automotive Industry called the speed limit proposal "a purely symbolic policy" without a clear climate or traffic safety payoff. In a statement to NPR, spokesman Eckehart Rotter wrote that speed limits would only shave 1 percent of carbon emissions. He suggested digitizing road traffic and introducing electric vehicles would do more for both climate and safety. An anti-speed limit group says it has collected 50,000 signatures. "A speed limit in Germany is only another screw in an ideology-driven system that has one goal: to destroy the car in Germany in the future," the group writes. Jack Ewing, author of Faster, Higher, Farther: The Volkswagen Scandal, said the autobahn culture burnishes the reputation of Germany's automotive industry. "Carmakers will tell you that demanding German drivers are why German cars are so good," Ewing, who is also a New York Times reporter, told NPR. "Their home market is in fact very demanding in terms of quality and performance. That's kind of in a way a proving ground for Daimler, BMW and Audi, and it helped make them successful abroad." Emissions from transportation have crept up since 1990, according to government figures. In recent years, Germany has taken measures to limit pollution from cars. Hamburg banned diesels from the city's center, NPR's Soraya Sarhaddi Nelson reports, although residents of the city worried it would decrease business without cutting down smog. Germany has also considered offering free public transportation in cities to bring down car use, NPR's Laurel Wamsley reports. Moves like this have triggered battles over German identity. The far-right Alternative for Deutschland party has adopted a "No diesel is illegal" slogan to rally its supporters. The AfD also opposes the newest package of proposals to impose speed limits and raise taxes on fuel and prices on fuel-inefficient cars. Federal AfD lawmaker Dirk Spaniel of the car-producing state of Baden-Wuerttenberg accused the committee of forcing citizens to buy certain products. "This is a planned economy instead of a market economy," Spaniel writes. In neighboring France, President Emmanuel Macron was forced to eliminate a fuel tax hike aimed at reducing carbon emissions after yellow vest protesters took to the streets in violent demonstrations, reports NPR's Eleanor Beardsley. Could Free Transit Lure Germans From Their Cars? Ewing said recent events may make Germans more receptive to speed limits despite previous opposition. The Volkswagen emissions scandal has raised the issue of air quality in cities. And Germany risks fines if it does not meet EU targets for greenhouse gas emissions. A survey published last year in Germany by the CosmosDirekt insurer found that 52 percent of respondents supported a speed limit. The staunchest opponents were the youngest drivers, aged 18-29. So far, the transportation changes exist only as a working paper. A final version is reportedly expected in March. Annalena Baerbock, co-chair of the Green party, told NPR that Americans are proof that a speed limit will not ding Germany's car industry. "The U.S. — in whose states a speed limit applies on all highways — has reliably imported German luxury cars for decades," Baerbock said. A previous version of this story incorrectly said that some 70 percent of German highways have no limits on speed. About 70 percent of the country's 8,000 miles of autobahn system does not have a speed limit, though other roads and freeways do.